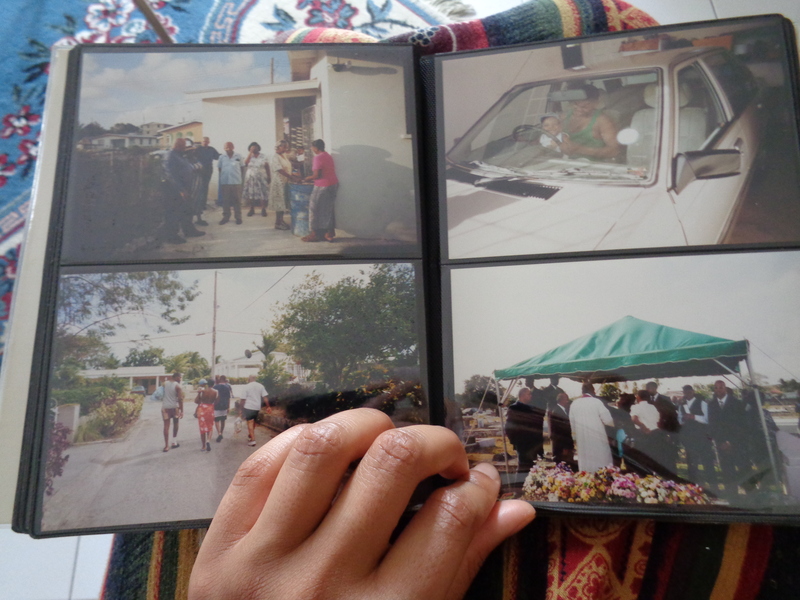 During October 2015, Rayanne Bushell – a Glasgow-based artist of Jamaican and Barbadian descent – is volunteering with Fresh Milk, working with our archive of documentation and images from the last four years of activities. In her first blog, she shares what it has been like to experience Barbados for the first time in fourteen years, visiting family and reflecting on the personal archives we accumulate in life, while reckoning with the history of the space. I have to admit that when I dreamed of returning to my ancestral home, until very recently, it was never Barbados that I had in mind. I lived with my mother and so while objectively I knew I had Bajan heritage and had even visited with my father in 2001, it had always been my Jamaican side that I clung to. In hindsight, I wonder why I never explored my Bajan heritage further. My grandmother who was born here is also one of my closest friends. But I guess I knew more about Jamaican history and culture and my family’s life there, so it was easier to claim. In the end it was art that brought me back to Barbados. In the summer of 2014 I was struggling with and against a homogenous, white, eurocentric arts education, institution and history. Around this time I met Tiffany Boyle and Jessica Carden of the curatorial duo Mother Tongue when they gave a lecture at the Glasgow School of Art on Maud Sulter and Oladélé Ajiboyé Bamgboyé, two artists who were absent from the “Glasgow Miracle” narrative despite being active, based in Glasgow and exhibiting widely at the time. Sulter is a huge influence to me and is part of what inspires my small endeavours into countering the continued under-representation of black and person of colour artists in the West. Mother Tongue have been a wonderful support of my research and practice, and it is through them that I found out about International Artists Initiated at the David Dale Gallery, a programme of exhibitions and events that coincided with the Glasgow 2014 Commonwealth games. Fresh Milk was one of the six participating artist organisations and upon seeing that they were based in Barbados, I contacted Annalee. As a result, I ended up assisting in the install and photographing of the exhibition and ultimately started a chain of events which led me to Monday at Grantley Adams International Airport, looking up at huge poster of Rihanna welcoming me to Barbados. On Tuesday, Katherine and Natalie showed Nadijah and I the Fresh Milk studio and offered a brief introduction to the Colleen Lewis Reading Room where I found two zines that I hope to add to my POC Zine Archive. Explorations of the reading room for my own research come at intermittent breaks from working through the Fresh Milk archive over the following few days. Through the process of organising and cataloguing thousands of files from various projects such as Tilting Axis, Fresh Performance and the Caribbean Art Map, I’ve been able to familiarise myself with the work that Fresh Milk does and so have a greater sense and understanding of the contemporary artistic activity on the island and wider Caribbean region. Sorting through folders relating to artists both international and local who have undertaken residencies at Fresh Milk has been an informative and inspirational process which also led to a continuous sense of déjà vu when I met members of the creative community irl when we attended the opening of Russell Watson’s Phylum at the Morningside Gallery at BCC. After 5 days on Walker’s Dairy, Nadijah and I used the weekend as a chance to see a bit more of the island. Friday night was spent at Oistins. My father insisted I should go and it turned out to be a site quite relevant to my current research around tourism, souvenirs and authenticity. On Saturday, we wandered through Bridgetown, attempted to visit the Nidḥe Israel Synagogue and managed to avoid the worst of the rain. Today, we both visited our respective families on the Island. Sunday bus services are a joke no matter where you are in the world, after waiting 50 minutes, I made it to my great uncle’s house in Black Rock, St Michael where my grandad is also staying. Lunch with familiar faces was a welcome change after a week of firsts. Hanging on the walls of my uncle Derwin’s house are an odd but complimentary mix of family photos, art prints and souvenirs. It’s started me thinking again about the photo album as artefact, family home as a living museum and the home-maker as curator. I’m not yet sure where it’ll lead this time, but the environment had me obsessively taking photographs which wasn’t happened in a while. I’ve been here 6 days, if I’m honest the greatest cultural conflict thus far, is the transition from city life to country living. Fresh Milk is situated on Walker’s Dairy, a farm that used to be a plantation. I understood what this would mean in theory, but in practice I wasn’t quite prepared for the lizards, frogs, cockroaches or mixed emotions conjured up from my location on a plantation; and reflections on my ancestors’ exponentially more violent experience of such a locale. There’s a lot to make sense of and get used to, I doubt 4 weeks is enough but I’ll take what I can get before returning to a no doubt grim Glasgow in November.